By law, the Post Office Department could not carry parcels weighing more than four pounds at the beginning of the 20th century. 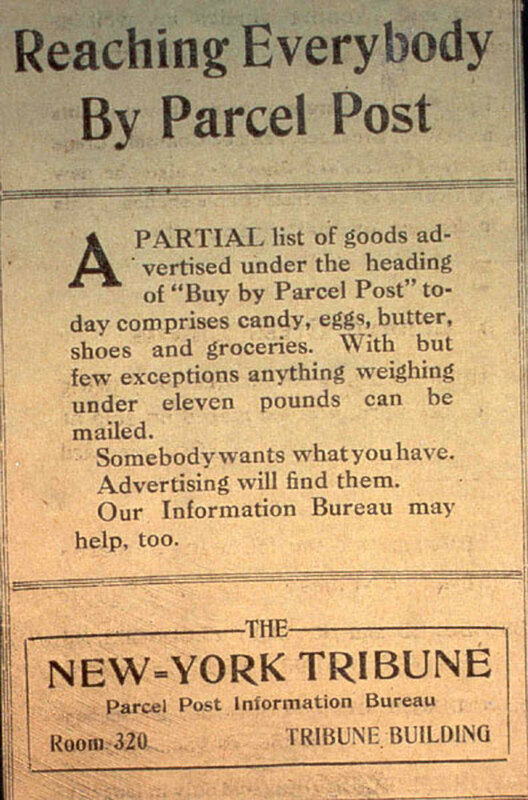 Private express companies, which had begun to flourish in the mid-1800s, delivered large packages. The establishment of rural free delivery had provided a heady taste of life for rural Americans. Soon the demand increased for the delivery of packages containing food, dry goods, drugs, and other commodities not easily available to farmers. Though express companies and country merchants fought long and hard against it, rural residents, who represented 54 percent of the country’s population in 1910, were equally emphatic in wanting Parcel Post. The Act of August 24, 1912 authorized Parcel Post and it officially began on January 1, 1913. It was an instant success, with 300 million parcels mailed in the first six months the service was offered. The effect on the national economy was electric. Marketing and merchandising through Parcel Post spurred the growth of the great mail-order houses. Montgomery Ward, the first mail-order company, started with a catalog of more than 100 products in 1872. Sears, Roebuck and Company followed Montgomery Ward in 1893. The year Parcel Post began, Sears handled five times as many orders as it did the year before. Five years later, Sears doubled its revenues.